I cooked a roast goose for Christmas and it went down a treat. Wild or home-reared, they are both great, but if you’re lucky enough to get out and shoot a big Canadian, Greylag or Greenland white-fronted goose, it’s a real treat. A pink footed goose tends to be a little smaller, so simply reduce the cooking times slightly, and serve it just for two. 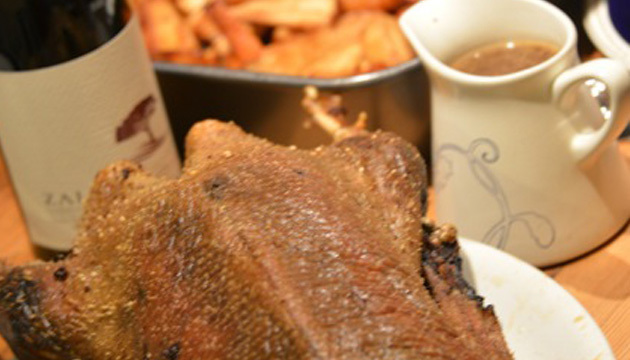 Goose is an amazingly easy bird to cook, but so many people mess it up trying to over-complicate it, so try this simple, yet delicious recipe, which I shared with William Powell Country back in December. Pluck and dress your bird, making sure to scorch any little feathers you miss. Place the neck of the goose, along with the vegetables listed above, in a saucepan. Cover with water and boil with a little salt and pepper. Once it’s come to the boil, reduce the heat to a simmer. Remember to keep your stock pot topped up with water so it doesn’t boil dry. While your goose is cooking, after an hour or so, drain off the liquid from your stock into another pan, and discard the vegetables and neck. The stock you’ve now got should be reduced over heat by about two-thirds, then add around half a jar of good-quality redcurrant jelly, season with a little more salt and pepper, and, once the jelly has fully dissolved, place your stock to one side. Finely chop your chestnuts in a food processor, then add the bread to make breadcrumbs. Add the sausage meat, and when this has formed a solid mass, remove this mixture from the food processor and stuff it in the cavity of the goose. Roast your goose on a tray in a hot oven at around 220c (this is the middle of the top oven of an AGA, or most ranges, for around 1 hour). After an hour, turn the oven down to 120c (or the top of the bottom oven of your AGA or range) for a further 3 hours. You’ll know when your bird is fully cooked as the skin will appear to have risen away from the meat of the bird’s breast, and if you poke it with a finger it will appear to have a void under the skin. Remove the bird from the oven, place on a carving tray, and cover with foil. Allow to rest. Now, returning to your redcurrant gravy. Once you have tipped the goose fat from the roasting tin, the cooking juices should still remain stuck to the bottom of the tin. Pour the gravy you made earlier into the roasting tin and bring to the boil on a hob, stirring all the time. Once the roasting tray has nothing stuck to the bottom, and the gravy is reduced to a thickness you like, pour into a serving jug. Carving a goose cooked like this should not be done in front of your guests if you wish to look elegant, as you will be pulling the meat from the bones with your fingers to get every last bit of goodness from the bird. With a sharp knife, cut the skin off the bird and keep to one side, then, using a fork (as you have probably seen in a Chinese restaurant with duck), pull the meat from the carcass and rip it apart using your fingers (or another fork). Scoop out the stuffing from inside the bird and lay it on the serving platter with the pulled meat. Make sure you don’t miss the meat on the back thighs and legs of the goose – all is great and worth getting off. Last of all, shred the crispy skin you put to one side with a sharp knife (it’s like goose crackling!) and lay on the serving platter. Serve at table with roasted winter vegetables – let your guests help themselves and enjoy hearing throughout the whole meal how wonderful you are!